Clary arrives onto the ship to save Jace from Valentine. Jace and Valentine begin fighting, and Jaces kills him. It's all a ruse; Valentine is pretending to be Clary and captures Jace. Valentine is keeping Underworlders trapped inside the ship. Back at the Clave, the group is searching for Jace. They can't find him with the equipment or Magnus' magic. Alec is visibly distraught. Clary and Jocelyn are reunited. She promises no more lies to her daughter. Clary gives her the mysterious box of Jonathan's mementos. But Jocelyn doesn't believe Jace is her son -- she saw him burn. Alec begs Magnus to use his rune to find Jace. Magnus refuses as the last time nearly killed Alec. Victor Aldertree is the new leader of the Institute and representative of the Clave. He replaces the old leadership and places the Institute on lockdown. Jace is being held prisoner and tortured within Valentine's boat. Clary gets interrogated by Victor. She defends Jace and tries to prove his innocence, giving as much information as possible. Valentine explains to Jace why he gave him up. Jace doesn't believe him and wants to kill him. Valentine shows him memories of him injecting demon blood into the fetus (Jace) to create a stronger being. An alarm is raised: Jace is now wanted "Dead or Alive" by the Institute. Aldertree places a restriction on Underworlders and they cannot enter the Institute without prior approval. He pulls the core group away from ever searching for Jace. Luke lets Simon crash at the cafe, but the wolf pack doesn't agree. They force him into a garage to sleep during the day. The new Shadowhunters on Valentine's ship are being trained. Valentine shows Jace why he can't leave the ship: He kills a warlock by forcing half his head through the barrier; it rips him apart. Isabelle spends time training Clary in fighting. She gives Clary life advice and some reasons why she can't help find Jace: She's been threatened by Aldertree to be de-runed. Alec's mother pleads with him to not go searching for Jace. 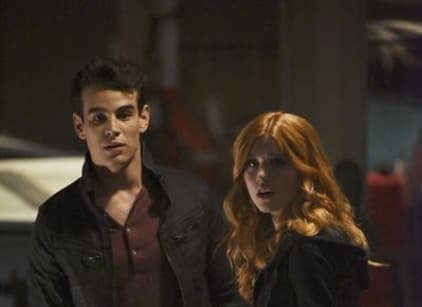 Clary pretends to be Aldertree, and goes to see Luke and Simon. Jocelyn comes to help Clary find Jace, but this is a lie. She takes Clary's phone and stele, and then proceeds to lock them both in the garage. Alec apologizes to Magnus about his attitude and the reasoning for calling off the wedding. Simon uses his vampire speed/strength to break down the door. When it doesn't work, he and Clary spend time reminiscing. The door falls open and they rush to find Jocelyn. Alec senses Jace on land while Magnus begins to use the rune to find him. Valentine unleashes Jace on a den of vampires to kill the leader/minions. Jace stakes all the minions but is held back after the leader, Maria, surrenders to the Clave. He stakes her after she taunts him. Jocelyn shoots an arrow at Valentine. Jace escapes with Valentine into the portal. Jace: You experimented on me? Valentine: I made you stronger, faster; more lethal than any other Shadowhunter. Valentine: To create the perfect weapon, the ideal marriage of good and evil: A Shadowhunter with pure demon blood. Permalink: You experimented on me? Isabelle: Any word from the Clave? Lydia: Not yet. We've been trying for the past four hours. Something's up. Magnus: Hmmm. The Clave being unhelpful? Who's shocked?! Show of hands. Permalink: Hmmm. The Clave being unhelpful? Who's shocked?! Show of hands.